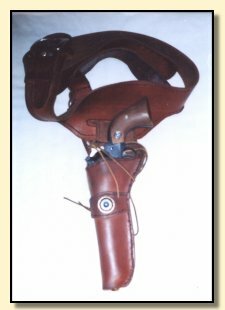 Our company, Leather Guns Etc became a reality out of a few simple needs. Being left handed, my choices for a new gun holster were limited. It soon became obvious that I would have to create my own rig in order to get exactly what I wanted. I went to a local saddle shop, bought a hide, studied some photographs and went about cutting and sewing by hand until I came up with my first rig. Soon, the needs of friends and acquaintances came into consideration. While out shooting or fishing, someone would see my left handed rig and ask if I could make one for them. Or sometimes, after learning that I had made the rig myself, they would ask me to repair something they already had. These requests kept me busy. After only a couple of years of working out of my den, the need for more space put Leather Guns Etc. into a building of its own. Soon after moving into our new building, I met an old timer in the leather working business. He had almost fifty years under his (leather) belt and was ready to retire. He started sharing some of his impressive knowledge and trade secrets. He also sent some of his work to me. My talents grew along with my skill. Now, I can meet any of your leather making needs...from original design to completed product! The Guns division of our company was actually an afterthought. Having satisfied the needs, our desires could be addressed. My wife and I have always enjoyed target shooting and share a great respect for firearms. We applied for and received our Federal Firearms License and now carry a full line of new guns and hunting gear. We also carry law enforcement supplies. This is the original holster and gun belt that started my small business. Despite my limited background in leather working, it turned out great and opened the doors to my current success! We are also the leather designers for Bond Arms, Inc. and have a fine example of a BMT for the Texas Defender model. All holsters are available for the Texas or the Cowboy Defender derringers on our holster page. We are proud supporters of SASS(Single Action Shooting Society) and the cowboy way. We have a lifetime guarantee on all our leatherwork so please give us a call, email us, or even drop by..... we'll be glad to hear from you. All of our leatherwork is done one piece at a time - cutting, forming and assembly by hand.